Painkiller: Hell & Damnation falls short of being a great game due to an abbreviated campaign, a few bugs and a throw away story. But, if you're willing to overlook its faults and don't mind the short campaign, it can be an absolute blast tearing through waves of baddies with the insane arsenal. Let’s be honest, the Painkiller franchise hasn’t had the easiest of all roads. While the original Painkiller was fairly highly praised by critics, the subsequent expansions, ports and mods brought to retail have sullied the game in the eyes of most gamers. This is fair, since those releases were pretty much horrid across the board. Many of us, myself included, thought the franchise was dead, or at least hoped it was to spare it further embarrassment. The Farm 51 had other plans, however, and surprised us with a reboot in Painkiller: Hell & Damnation. It may have a new shiny coat of paint and a revamped engine, but it’s the same Painkiller we loved almost ten years ago. Well…. almost. And that’s where the problem is to be had. Calling Painkiller: Hell & Damnation a reboot is a bit disingenuous. Painkiller: Hell & Damnation plays out more like an homage to everything that was awesome about the original in a “best of” format. The game has been heavily truncated. The original Painkiller featured 24 levels and the Battle out of Hell expansion featured an additional ten levels, leaving a fairly beefy game even if not all of those were exactly fantastic. Painkiller: Hell & Damnation is limited to 14. I really can’t understand the logic behind this, as it turns an already short game into something I was able to complete in four hours. 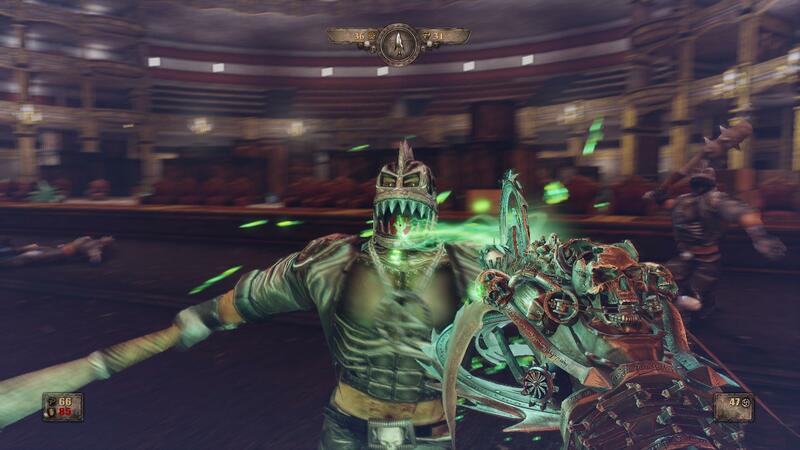 Painkiller had some incredibly memorable moments that didn’t make the cut, such as being able to tear down the Opera House’s chandelier onto your foes or the absolutely fantastic warzone lost in time that closed out the game. Don’t get me wrong, playing through the updated Theme Park is an absolute blast but knowing that there’s so much more that should have been here really put a damper on the experience. While Painkiller hasn’t ever been huge in regards to storytelling, Hell & Damnation seems even more bare bones than I remember. Players take on the role of Daniel Garner (voiced by none other than John St John of Duke Nukem fame, as well as being my personal favorite narrator for Fifty Shades of Grey) a man trapped between heaven and hell desperately trying to find his wife. Death promises to reunite the star death crossed lovers if Daniel can provide 7 thousand souls as payment. As you progress through the game, you’ll be joined by Eve (yes, that Eve) who tries to warn you to be careful. It’s extremely hard to follow as the game seems to think you either already know a bit of Painkiller lore or simply don’t care about the story and would rather focus on blowing things up. 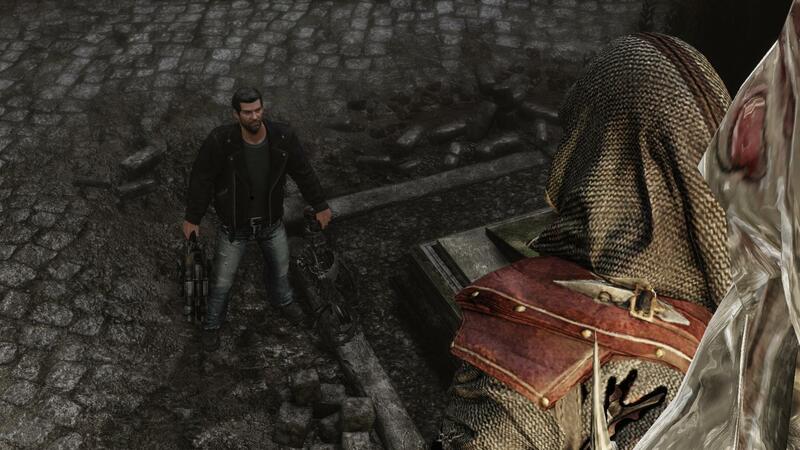 As usual, Painkiller really thrives when it comes down to the weaponry you’ll use to dispatch demons. Everything is completely over the top and feels absolute fantastic in use. Each weapon seems to carry a bit of weight behind it and justifies the massive amount of damage you can pull off. The new addition of the Soulcatcher is probably going to stand out as a favorite for many players this go round. The primary fire launches a saw blade capable of cutting down enemies in a line all while rendering their limbs free from their torsos. The alt fire is a low damage beam that drains health and ultimately the soul of your foes, storing them in the weapon. Once the weapon is fully charged, you can launch out a powered blade that converts enemies in a small radius to your side, giving you a bit of help in the battle field. The weapons are completely overpowered and insane, exactly what I would expect from a game of this lineage. The Farm 51 tried to upgrade the controls to fit the modern gamer and the results are a bit of a mixed bag. 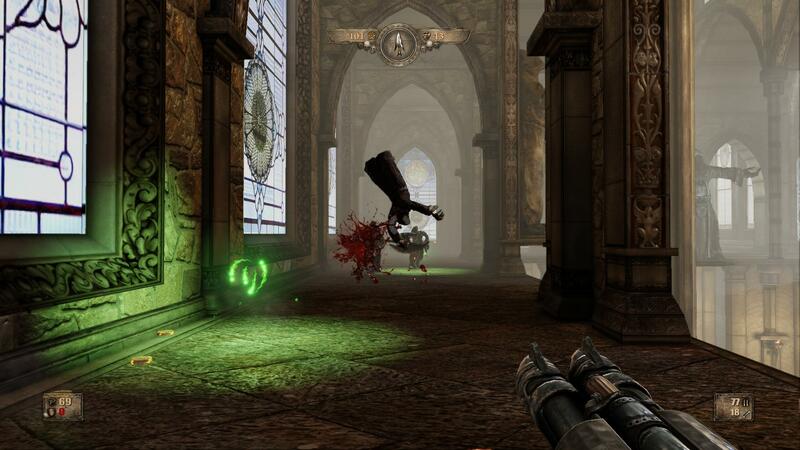 The Painkiller Staff’s alt-fire and the Stake thrower’s grenades have been mapped to individual buttons, essentially introducing melee and grenades into the mix as a more standard affair. The default scheme isn’t too accommodating for those of you with smaller hands or less nimble fingers, so I’d highly recommend looking into remapping a few buttons. If you’re anything like me with freakish Slender Man fingers, you should be ok. The game is also fully playable with a controller. Soup is also fully edible through a shoe. Just because something is there, doesn’t mean it’s any good. The controller scheme is clunky and without the ability to remap buttons you’re kind of stuck with what you get. Cycling through the weapons can be a bit of a chore and trying to balance some of Painkiller’s nuances with the sticks just feels cumbersome. Let’s hope they address this before the console release come January 22nd. While I lamented the levels that didn’t make the cut for Hell & Damnation, I was sadly surprised to find some of the AI did. The old school twitch shooters didn’t really need much when it came to enemy AI, the goal was to send hordes of baddies at you and let you try to deal with the onslaught. 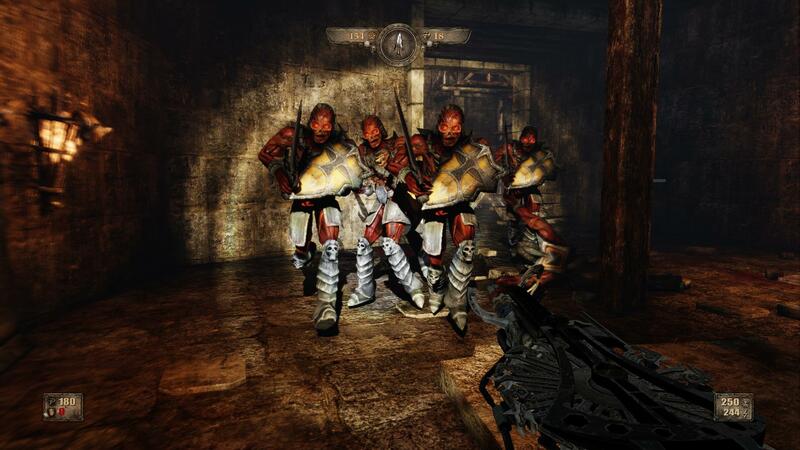 The issue arises when the enemies get stuck behind scenery unable to pose any real threat or get lost in the level leaving you to hunt them down before you can progress. The compass will show you where the slackers are hiding out, so it’s not a major issue, but it’s an annoyance that should have been caught. However, I imagine this will be patched fairly quickly. Other issues, such as having to wait for bodies to disintegrate into green souls, slow down the action just when things are really starting to heat up. Minor complaints to be sure, but when we’re talking about a 5 hour campaign the core experience really shouldn’t be marred with these flaws. Hell & Damnation brings co-op into the mix, but I can’t imagine this gaining any real traction. It’s a blast blowing away hordes of baddies with a buddy, but without being able to tell where your friend is on the map, it can be hard to keep track of exactly what’s going on. The ultimate nail in the coffin is the inability to save your progress playing through co-op. You can choose what missions you want to play through, so it’s easy to simply do your favorites, but removes any real incentive to sit down with a friend and go to town. The competitive multiplayer sees some massive upgrades from the original Painkiller, but I do have to wonder if it’ll be enough. The new modes help spark a bit of interest in the mode, but I don’t know if that alone will be enough to pull players over. If you’re still playing the original Painkiller online, you don’t need a new physics system or better visuals to pull you in. Players new to the series will get a taste of some old school twitch shooting, but there are better examples of it out there. 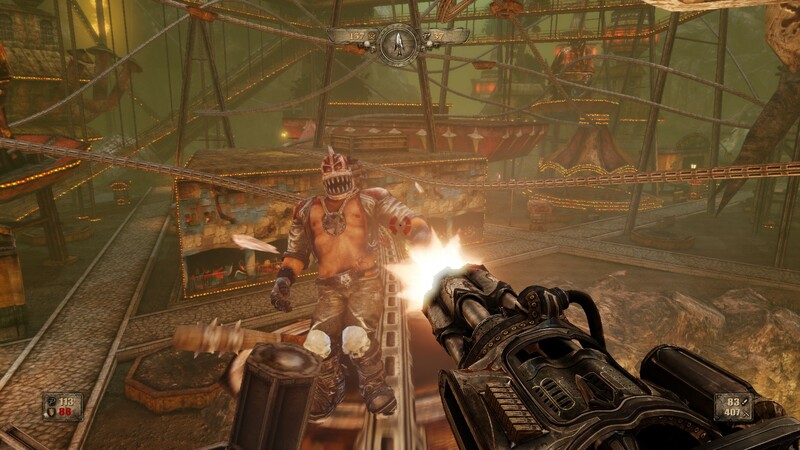 The one thing that matters the most when it comes to games is if it’s actually fun to play, and I can say overwhelmingly that Painkiller: Hell & Damnation is a blast. While it was over too soon and had its share of issues, I immediately wanted to play through it again when I was done. Watching a line of skeletons topple to the grown as I saw off their legs never got old, and there was enough challenge to keep me coming back to my keyboard. I can’t say for certain that I would recommend it over the original Painkiller: Black Edition which is half the price and offers a bit more, albeit through a dated game, but I can say that newcomers shouldn’t be wary of picking this up. Painkiller: Hell & Damnation wasn’t the complete reimagining of the franchise it needed to put it on top, but it’s a far cry from the laughably bad games the series has suffered through recently. Hopefully The Farm 51 continues developing their interest, and with the next title we’ll see something surely worthy of reclaiming its crown.